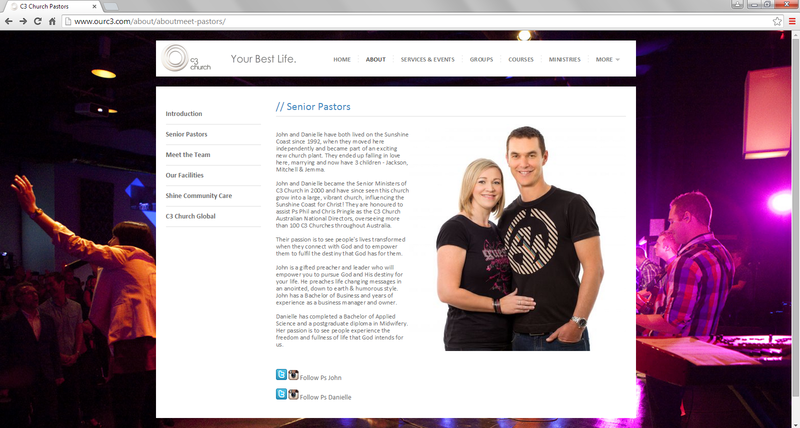 John and Danielle Pearce are pastors of C3 Kawana Waters. Source: About, OurC3, http://www.ourc3.com/about/, Accessed 04/02/2014. Why is C3 still allowing Kong Hee, (who is currently in court for mishandling church of up to 46.3 million dollars), to speak in their churches? Wouldn’t it make more sense for C3 to wait after the trial? 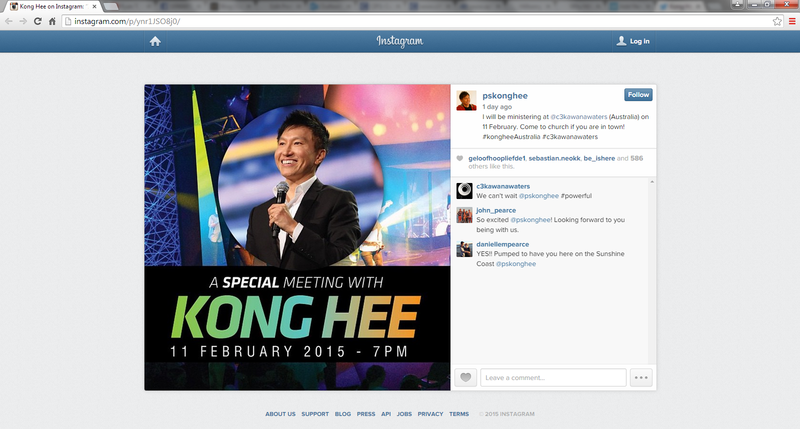 A lot is at stake here if the allegations against Kong Hee are true. Source: pskonghee, Instagram, http://instagram.com/p/ynr1JSO8j0/, Accessed 04/02/2015. Notice the comments from the Kawana Waters Senior pastor in the below screen grab. It crossed our mind that maybe Kong Hee is short of money to pay for his lawyers again. Will he be manipulating C3 people for financial gain again? Would like to know how they got Kong and C3 Bridgeman Downs don’t have him speaking (as we know thus far). Might be a safe bet fundraiser that won’t set off too many alarm bells. Maybe the Singaporean DPP can send out some spies…. “Our services are never boring! Whether it’s the modern music (think U2), the great programs for the kids, the relevant easy-to-listen-to preaching….“. If I wanted to collect some free money to help me pay for my lawyers (and perhaps some for the duty free on the way back home) that would be exactly the kind of congregation I’d be targeting! Actually I’ve been thinking about it – and my bet is that these speaking (not preaching) engagements are directed from none other than the top – from Dr Phil himself. Prepare for some last minute announcements. Possibly not from the bigger congregations, so not to attract too much attention. Maybe they have a target to reach and will keep adding “leadership meetings” etc until they’ve achieved it. I do think you’re right, in all likelihood “Dr” PP is co-ordinating this. I doubt KH would have organised this himself, certainly not without PP’s approval. If only Kong Hee could paint! Anointed by dr phil AND kong hee..double anointed paintings…get them while they’re hot. I wonder if phil realises how very sad it is to have sunk so low, so often. Unfortunately it is doubtful that Phil Pringle realizes any more than any other wolf, because these men and women show all the evidence of reprobate minds. Their consciences do not show any evidence of sorrow, even though they are cheating millions upon millions of donators, only for the purpose of building/maintaining personal wealth/power for themselves and their family members. Phil Pringle could have let the Kong Hee situation continue to crumble on its own, however he has instead chosen to continue to beg the world for more funds (which are desparately needed elsewhere for legitimate causes), while everyone watches Kong Hee’s lengthy yet long overdue demise.